2 Bedrooms (Queen Master, Queen and Twin in 2nd, 2 full bathrooms, sleeps 5-6. This condo is newly listed for renting. Breathtaking direct ocean views from living room, master bedroom and kitchen. Swept away by the beautiful ocean view! The building is nice and the condo has a great convenient tucked away location on the first floor. Inside was clean. The beds were Not very comfortable and neither were the pillows. I would say bring a good pillow and you are set. We have 2 kids 6 and 2 and it was a perfect size getaway for us. I give this condo 5 stars because the location and view are amazing! The condo also provided pool and ocean necessities. Floaties for the pool and chairs for the beach. Yes beds and pillows can be very subjective because some like soft and some like more firm. I'll look into the pillow issue. There are extra pillows in the closet that may not have been noticed. Thank you for your stay. Awesome stay, very clean and convenient . We have rented many different Condo's, in Florida, over the past two decades. Understandably, with some of these previous rentals, we have had a few issues. To the credit of the owners, those issues were always resolved expeditiously and dealt with in a business like manner. That was not the case with this rental. Based on our experience renting this unit, the issues that arose and how the owner dealt with those issues, we would never rent this unit again or deal with its owner. It is very unfortunate that this guest felt this way and is trying to hurt my rating and reputation. I have always had great reviews and treat guests how I would like to be treated on vacation. I take all concerns personally and strive for excellence. This traveller is being spiteful because he tried to blackmail me for monies for a good review. He originally sent me a letter wanting an excessive amount of money “before” he posted his review. I did not accept that because we did everything possible for this traveller to minimize any disruption. The basic issue is that my fridge broke down and rather than spend several days waiting for a part I bought a brand new fridge within 2 days. He was offered other remedies to keep any food preserved and I would have reimbursed him for any food that had spoiled. He had 5 days left of a 30 day rental so he couldn’t have that much food left. Therefore he is extremely unreasonable in his review about “how” the issue was handled. It I was the only issue I was aware of. His actions will be reported to VRBO on his blackmail attempts. Some people just want a free vacation on the backs of others. This traveller should not be so ungrateful and spiteful and is a nightmare to rental owners using the VRBO site as a booking venue. No one should be held for ransome in lieu of a great review because that not fair nor democratically ethical. Truly sad. Gloria great to work with and room is fantastic! Looking forward to our next visit!! We really enjoyed our stay at your condo it felt like home! The condo was furnished with everything we needed and the first level was ideal for our family. 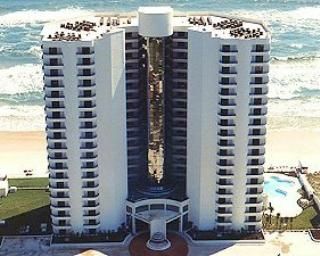 We would recommend this condo and look forward to our next vacation at the Ashley in Daytona. We enjoyed our stay at The Ashley. The bottom floor was nice not having to deal with elevators and stairs. Easy access to the beach, we just went out the back of our unit and had no worries with keys or cards. Hosts popular international events such as NASCAR, Bike Week, Spring Breaks and just plain old relaxing, boating and fishing. Property is on the border between the drive and no-drive beach. If you prefer the no-drive, then it is conveniently available a few steps south of the Ashely Condo property.